Most Olive trees are man-made cultivars, rather than true botanical varieties, and won’t reproduce true to seed; they are propagated by grafting. Seeds are planted, though, being cracked before planting to help them germinate. When seedlings grow up from them, they are either used as rootstock to which cuttings from other trees are grafted, or let grow and examined to see whether they might be a new variety which is worth developing. Olive trees are evergreens with pale grey bark and gnarled trunks. The tree height ranges from 12 to 30 feet (3.5 to 9 metres), depending on the cultivar (and pruning, of course.) The trees can live for hundreds of years. Their wood can also be used for furniture. Olive trees can withstand some cold: in fact, they need some or they won’t produce fruit. They are not, though, trees meant for where a real winter happens. At 17 F (-8 C), frost-damage occurs to the trees. At 12 F (-11 C), the damage is severe. Below 10 F (-12 C), most of the tree above ground may die, though the tree might grow back overtime from its roots. Olive trees generally start to bear fruit at 5 years of age, though this can vary by cultivar. Olives grow on branches from the previous season. Harvesting in New World countries such as America, Australia and New Zealand is largely done with machine. The Israelis are also big on mechanized harvesting. Producers in Southern Europe would like to go this way, but the cultivars of Olive trees that they grow, which produce the prized oil they are famous for, don’t always lend themselves to harvesting by machine either because the branches grow too high, or the Olives cling too tightly to the branches. The Australians, in fact, continue to prove that they are the most innovative country in the Commonwealth through their attempts to automate Olive harvesting even further — by using shock waves. “The use of shock waves to remove Olives has been tried but not yet successfully. As always, Australians will think outside the square and experiment with other technologies such as the Hawke Harvester, which will be unveiled in October 2002.” (Peter Birch, 2001 Fellow, Winston Churchill Memorial Trust of Australia.) The next time you hear a sonic boom, that could just be the Olive harvest in Australia. 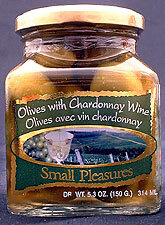 In America, Olives are grown in California, and to a small extent in Arizona, New Mexico and Texas. California only produces .5 to 1% of the Olives in the world — though it’s hard to believe from their marketing board! Botanically the Olive is a fruit classed as a “drupe” – a fruit with a single large pit (aka stone) inside. Green Olives and Black Olives will be fruit from the same tree, just picked at different stages. 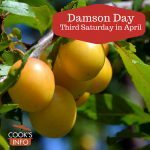 It is pale green when immature, darker green when it has reached its full size, then purple or black when ripe. Green Olives have more zing and more bitterness than Black Olives; Black Olives lack the zing, but have a richer, mellower flavour. The size of an Olive depends more on the tree it is from than how young it is picked. While the pulp of most fruit is water — with Olives, it’s oil. Most Olives grown in the world are used for Olive Oil. Olives are actually quite bitter when eaten straight off the tree. See the separate entry on Raw Olives for more details. The method of “curing” them to draw out the bitterness helps determine the flavour and texture of the finished product, which is called “Table Olives” (also referred to as “prepared Olives” or “Pickled Olives.” Olives for Oil are not cured. How an Olive is cured actually has more impact on the taste of the final product than what cultivar it was or where it was grown. Some cures will produce juicier, plumper Olives than other types of curing. After curing, Olives are then finished off in a variety of ways: brine, vinegar, oil, etc. Spices and herbs may or may not be added. The brine that Olives are placed in after curing is called the “mother brine.” They will ferment in this. They will also ferment a bit in any brine they are ultimately packed in afterwards. Sometimes Olives are pasteurized to prevent this, which lets them be shipped more easily, but the pasteurisation does affect the flavour. It’s often very hard to know what variety or cultivar of Olive you are actually eating. Olive oil jars almost never say what type of Olives the oils were made from, and only rarely does a jar of Olives prove any more helpful. The list of “types” of Olives that you can buy is actually a mix of actual names of actual Olives, and names of various classs and methods of preparing them for table use. Every parish with more than 10 people and 2 cows between Athens and Marseilles makes its own special kind of Olives, so the overall list is very long. See separate entries on these various cures. 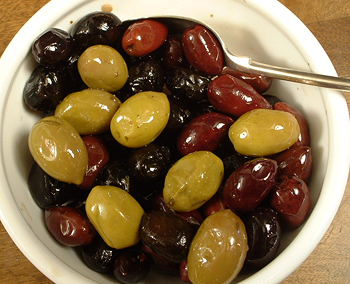 In the Eastern Mediterranean, Olives are largely eaten out of hand or as a garnish. Black Olives are more typical, and they are more likely to be brine-cured. At the Western end of the Mediterranean, Olives are used as well as an ingredient in other dishes. The preference is for Green Olives. The Olives are more likely to be lye-cured. Some say that if your Olives seem too salty to you, you can boil them for 2 or 3 minutes in water to take off some of the salt. That’s going to boil away a heck of a lot of the flavour, too. If you want Olives with less salt and flavour, just buy the blander generic commercial ones to begin with and keep them on hand for cooking. Lye-cured Olives, for instance, are cheaper, less salty, and won’t influence the flavour of dishes as much as brined ones will. Save the more, expensive, tasty ones for eating out of hand. It would be a crime to boil them. The easiest way to pit (stone) a lot of olives for cooking is by squashing them with the side of a chef’s knife, then picking out the pits. Add Olives to cooking at the end. Unopened tins of Olives have a shelf life of about 3 to 4 years. Store opened tins of Olives in the fridge covered in the liquid they came in, covered with plastic wrap for up to 10 days. If you drained away the brine, use instead 1 cup (8 oz / 250 ml) of water with about 1/2 teaspoon of salt in it. Don’t put Olives packed in brine in a sealed Tupperware container; they need to be able to breathe a bit. Store Olives in the refrigerator (though in some cultures, they store them at room temperature, taking care to ensure that the Olives always remain covered in Olive oil or brine or the pickling solution). Olives are native to Asia Minor. Greeks brought Olive trees to Southern Italy and to Southern France. It’s a mystery who realized that they were edible if cured, but it was the Romans who came up with lye curing. Greece was originally much more forested than it is now. Much of the forest was cleared to plant Olive trees. Because a good deal of the land was hilly, and Olive trees don’t have surface roots that top soil can cling to, over the centuries much of that top soil has been washed away, leaving parts of Greece with the rocky, sun-washed looking landscape that many parts of it have today. In the City-State of Sparta, cutting down an Olive tree was punishable by death or exile. The Akademeia at Athens (where Plato taught) contained groves of Olive trees sacred to the goddess of Athens, Athena. Legend had it that they were grown from the original Olive tree Athena had given to Athens. From 146 BC to 88 BC, Athens was an ally of Rome, but in 88 BC sided with an enemy of Rome, Mithridates VI of Pontus. In 86 BC In 86 BC, Lucio Cornelio Sulla, who had assumed dictatorship of Rome, sacked Athens. He had all the Olive trees cut down to use in making siege engines. After Athens fell, it became a permanent part of the Roman Empire. The trees were later replanted by Romans — many Romans came to despise the memory of Sulla’s tyranny. The Spaniards brought Olive tree cuttings to Peru in the mid 1500s. In the 1700s, Spanish monks brought Olive cuttings to Mexico and then up into California. The first recorded California planting was in America was in San Diego in 1769. The founder and King of Athens, in myth at least, was King Kekrops (or “Cecrope”). He held a contest to see which god Athens would choose as its patron and protector. Athena won the contest when she put the point of her spear in the ground, and an Olive tree sprung up. The Parthenon is built near where this first tree reputedly sprang up. Wily tour guides in Athens today all have various Olive trees they point to as being that exact tree. The famous French chef, Georges Auguste Escoffier (1846 – 1935), felt that Olives should be peeled. The Olive tree is not related at all to Russian Olive or to Texas (aka Mexican Olive) trees. Those aren’t Olive trees at all. FAO. Olive Germplasm: Cultivars and World-Wide Collections. Food and Agriculture Organization of the United Nations, Viale delle Terme di Caracalla, Rome, Italy. 1996 (Retrieved from http://www.fao.org/scripts/olivo/query/olcoll3.idc?CODC=030 in July 2004).